KATHMANDU, June 24: The results of Secondary Education Examination (SEE) this year could not match the expectations raised by last year’s result with more number of students scoring Grade Point Average (GPA) from 0.85 to 1.20, which is the second lowest grade. 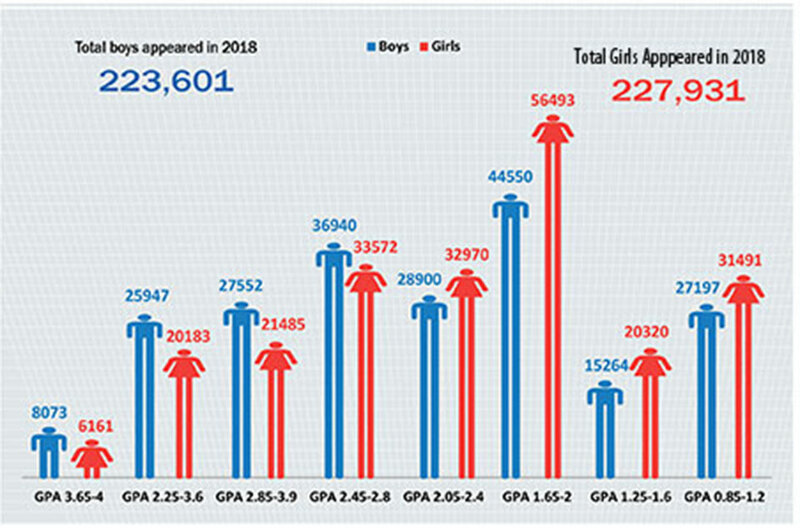 Of the total 463,689 students who appeared in the SEE which had taken place in April this year, the number of students scoring GPA from 0.85 to 1.20 is 58,688, which is almost 10 per cent more than the students who secured the same GPA in last year’s SEE. The Office of the Controller of Examinations (OCE) published the results of SEE on Saturday. Total students appeared in 2017 and 2018. Total number of boys and girls appeared in 2018. The percentage of students obtaining GPA from 0.85 to 1.20 stands at a whopping 13 percent this year when the students scoring the same GPA last year was just 2.53 percent. Last year, of the total 445,564 students who appeared in the SEE, a total of 11,285 students had scored GPA from 0.85 to 1.20. However, the number of students securing GPA from 0.00 to 0.80, the lowest grade of SEE, this year is nil. A total of 15 students had scored the lowest grade in last year’s SEE. Experts have said this year’s SEE results have indicated that the quality of secondary level education has gone down. 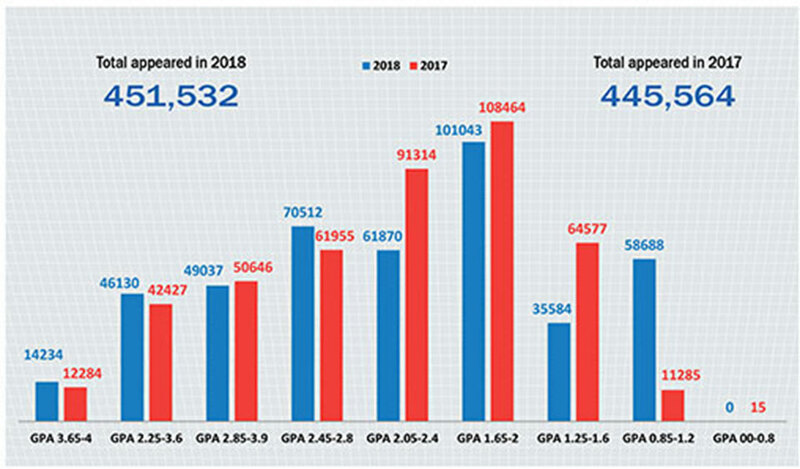 “Increment in the number of students obtaining GPA from 0.85 t0 1.20 shows that neither the students are studying seriously nor the teachers are teaching effectively as per the newly introduced GPA system,” said educationist Bidya Nath Koirala. He said that the government should immediately make serious changes in the pedagogy and teaching methods under the grading system. However, the number of students securing GPA from 1.25 to 1.6 has decreased compared to last year. Compared to last year’s result of 14.49 percent students obtaining the GPA, 7.88 percent students have scored the same GPA this year. Similarly, students obtained GPA from 2.05 to 2.4 is 13.7 percent, which is 7 per cent less than the students obtaining the same grade last year. Koirala said that the government should immediately make serious changes in the pedagogy and teaching methods under the grading system. However, the number of students obtaining GPA from 3.65 to 4, the highest grade of SEE, has slightly increased this year. Of the total students, 3.15 percent have obtained the highest GPA this year while 2.75 percent had scored the same GPA last year. Likewise, the students scoring GPA from 2.25 to 3.6, the second best grade of SEE, is 10.21 percent this year. Likewise, 9.52 percent students out of the total students had scored the same grade last year. Similarly, 10.86 percent students have obtained GPA 2.85 to 3.9, the third best grade of SEE, this year. Last year, 11.36 percent students had scored the same grade. The number of exempted students this year is 25,138. Of the total 451,532 students who appeared in the SEE, 8,906 students had taken the exams from the technical side.